Select the Alternative location option as a restore destination. For a database backed up with transaction log backup turned on, you can also select the necessary point in time using the Point in time Timeline. For more information, see Using the Point in Time Timeline. 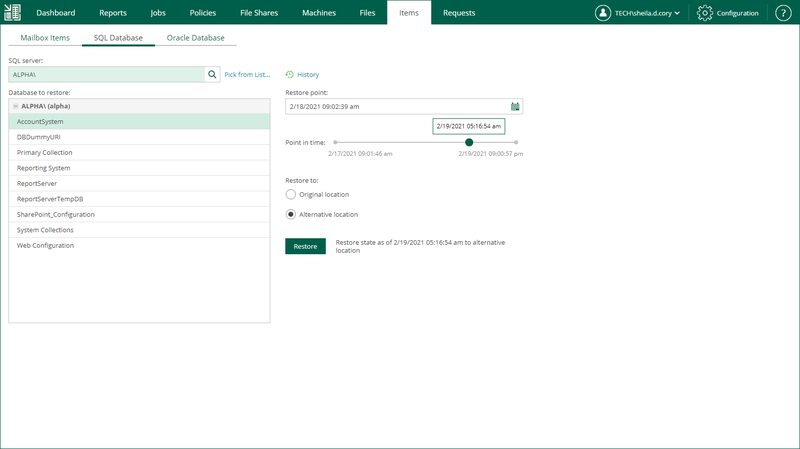 For more information on the transaction log backup, see Microsoft SQL Server Logs Backup and Restore section of the Veeam Backup & Replication User Guide. At the Target Server step enter the target Server Name and credentials for it. Specify the name of the target database. You can enter separate credentials for accessing the target database, picking the Use the following credentials to access the database option. You can also Use SQL Server authentication if needed, by picking the according option. Once you are done, click the Next button to take you to the next step of the wizard. If you have Always On availability groups present on your target server, the next step allows you to add the restored database to it. On the Files step you can choose specific paths for restore target locations. You can specify separate target locations for the primary database file and secondary database file with logs. Once you are done, click the Finish button. Once you click the Finish button, you will be taken to the Items tab. There, you can watch the status of the restore procedure. Beginning — refers to the previous restore point of the SQL Server machine which contains the selected database backup. If the previous restore point (server backup) was not found, or the database backup does not exist in it, then the Beginning will refer to current restore point. End — refers to the next restore point which contains the selected database backup. If the next restore point (server backup) and the corresponding transaction log backup were not found, or if the database backup does not exist in the server backup, then the End will refer to the current restore point. If the next restore point (server backup) was not found, but the transaction log backup exists for the preceding period, then the End will refer to the latest log backup time.